Solution to Crossword Puzzle and 5 Pattern Package Winner! 2. Used to indicate points of shaping or rows completed. 7. A visual of the pattern. 9. Holds a group of stitches to the front or back. 11. Smooth on the front of the fabric. 1. A way to join sections horizontally. 4. Adding a stitch to the knitting. 6. Used to measure the amount of stitches and rows to an inch. 8. The edge or border of the knitted piece. 10. Used in lace knitting for one. 12. Has a pebbly surface that is identical on both sides. Linda Jones! Congratulations Linda! Lucky you! You are the winner of a 5 Loom Knitting Pattern Package! Drop me a note to claim your prize! Thank you everyone for stopping by this week and playing my silly games! It was fun seeing everyone and I hope you had a great time! Blog Party Day 5 - Knitting Crossword Puzzle and Winners Announced! Time to get out the cake and icecream! Today is officially my blogiversary! CONGRATULATIONS Liz! Thanks for playing! Drop my a note and claim your prize! Pam! CONGRATULATIONS Pam! You get to pick from either my Loom Knit Toe Sock Pattern or my Family of Loom Knit Gloves pattern! Let me know which pattern you choose! Stay tuned til tomorrow, Saturday, January 17, 2009 for the third and final prize announcement! The lucky winner will win a 5 pattern package of my loom knitting patterns! The game is still on so keep playing! 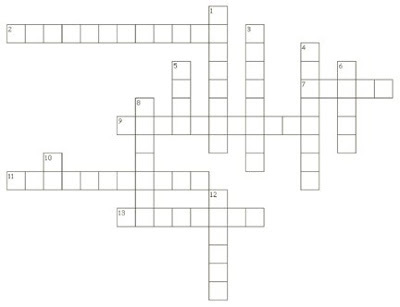 Before you go for today, here is a Knitting Crossword Puzzle for your enjoyment! Have fun, and thanks for stopping by! We are gearing up for the big party day! Friday, January 16, 2009 marks my two year Blog Anniversary! If I mentioned earlier it was my one year anniversary, I must have had too much virtual bubbly because I realized my blog is two years old tomorrow! When the picture puzzle was correctly put together, the message that popped up was: "loom knitting is fun and easy". 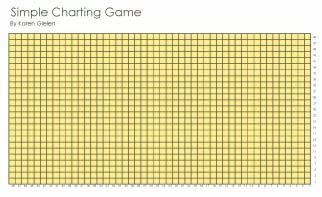 I had a lot of people ask me to post the solution for the Simple Charting Game also. Sorry for not doing that! Everyone that posted or sent me their guesses got it right! The hidden message in the chart was "Let's Party!" I don't expect you to read the posts, just look for the pictures, write the title of the post down and comment in THIS post what your guesses are or drop me a message. Good luck and have fun! The party is in full swing! I am having a wonderful time and I am really enjoying seeing all of my friends stopping by to wish me a happy blogiversary! I hope I didn't tax your brains too much with yesterday's game :) I had a lot of fun putting it together. The game is now officially closed. Not to worry, I have a few more games up my sleeve and more chances to win! In this post from last year, I wrote about my adventure in meeting Isela, the author of Loom Knitting Primer. I was so excited to learn she was going to be in my area for the Knit Out and Crochet 2008 event at the Mall of America in MN. I was even more excited when I found out I was able to go! 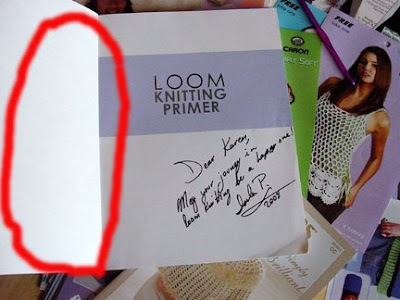 Even though I had a tough time with bringing my children along and I didn't get a Keepsake Loom, I was still very honored to meet her and bring home my copy of Loom Knitting Primer with her autograph! 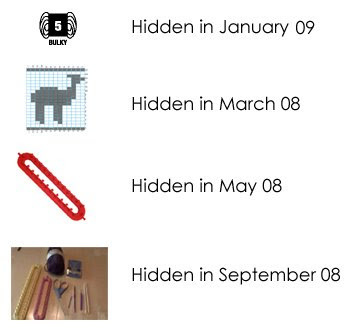 Today's Picture Puzzle contains another secret message. Once again, to keep things fair throughout the game, I will not post any comments until tomorrow morning. I will place a CLOSED banner above the game when it is officially over. Successful guesses of the secret message will be entered into a drawing for a copy of my Family of Loom Knit Gloves or a copy of my Loom Knit Toe Socks pattern. The winner gets to pick! I will draw a name and announce the winner on Friday, January 16, 2009. To begin playing, click here! Place a comment in this post or tap me on the shoulder here at the party and let me know what your guess is. Good luck and have fun! ETA: The message pops up when the puzzle is complete! The guest are slowly arriving. The h'ordeurves are going around. Grab a drink at the open bar and settle down on the couch or love seat and try your hand at this Simple Charting game I've created just for my loom knitting friends! To sweeten the deal, I am inviting you to post a comment here when you are finished letting me know what it is a picture of and you will be entered into the drawing for a copy of my Loom Knit Toe Sock pattern! If you don't have the ability to post a comment, track me down here at the party and whisper your answer in my ear. To make the game fair for all, I will not approve any of the guesses until tomorrow morning when this game is officially over! I'll place a CLOSED above the game. The winner will be announced on Friday, my official Blogiversary! Click here to download the file. The latest version of Adobe Reader must be installed to view this file. Edited to add: To play the game, download the directions and print the file out. Sit down and place an "x" in the spots on the chart where the written directions say to purl. It helps to count the blank spots on the chart that equal the knit stitches. When you figured out the picture, drop a comment in this post with your answer! Good luck! In celebration of my upcoming bloggy anniversary, I have created some fun and games for my loom knitting and fibery friends! 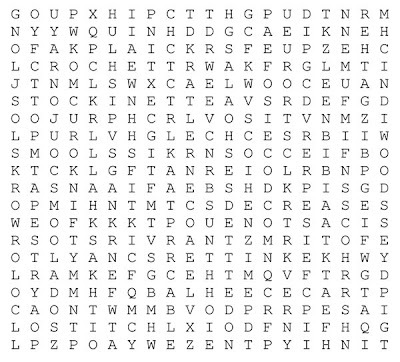 Today's game is a Loom Knitting Word Search! Have fun! Friday Fill-In since I have a bad pain in my neck! 1. It's January; time to get out the alpaca socks, a deep freeze is headed our way and we are going to have high temps below zero next week. 2. Sleep is what I crave most right now (I coughed all night and couldn't sleep). 3. Cork and wine go together like yarn and a loom (hee, hee). 4. Rest is so nourishing. 5. Let us dare to make changes to the new CPSIA law taking affect February 10, 2009. 6. Welcome to my home. 7. And as for the weekend, tonight I'm looking forward to going to bed early (hopefully I won't cough up my lungs and can rest), tomorrow my plans include celebrating a belated Christmas with my family and Sunday, I want to have a belated Christmas brunch! I snagged this from Denise's blog. Copy, paste, and bold what you have done! 71. Eaten caviar, unfortunately, yes, YUCK! 85. Read the entire Bible once, would like to do so again! Loom knitting "knit" stitch definition - let's clear some things up! Let me begin by saying I am by no means an expert. I am merely sharing knowledge I've picked up over the past few years. I've technically known how to needle knit for over 30 years -- I learned when I was 8 years old or so. I did not, however, devoted too much time to needle knitting since there were many other crafty sort of things I was more interested in. Loom knitting piqued my interest almost 3 years ago and then I became a lot more interested in needle knitting as a result. I starting truly studying needle knitting and playing around with it so I could convert it over to the loom for my own personal use and to open myself up to more design ideas on the loom. Over the past several years I have seen the subject come up over and over again on my loom knitting forums about the difference between the regular knit stitch, the e-wrap knit stitch, the flat knit stitch, and the reverse purl. To a new loom knitter, this causes a great deal of confusion! I know, I've been there! When a new loom knitter thinks they have things all figured out they come across a pattern that says they need to use the "flat stitch" and it then it says to knit in stockinette stitch (more on that later) and they get all confused because all along they thought they were doing stockinette stitch when they were e-wrapping and knitting off for row after row after row straight! Arrrrrrrrrrgh! Flat Knit Stitch = lay the working yarn ABOVE the loop on the peg and with the loom tool take the loop and bring it up and over the working yarn creating a new loop (this can be a very tight stitch). Here is a video demonstrating the flat knit stitch on the loom. slightly wrap this working yarn around the peg and towards the inside of the loom. Take the loom tool and bring the loop up and over the working yarn (this is a way to make the flat knit stitch less tight). Here is a video demonstration of this version of the "knit" stitch. Regular Knit stitch or what some refer to as the Reverse Purl stitch= lay the working yarn over the loop on the peg and with the loom tool, come from under the loop and snag the working yarn to create a new loop, take the old loop off of the peg and replace with the new loop (this stitch resembles the knit stitch created from standard needle knitting the most). You can watch a video of the regular knit stitch here. E-wrap or what you may see referred to as the Twisted Knit Stitch =e-wrap all the pegs and then e-wrap each peg again. With the loom tool bring the bottom loop up and over the top loop. Video demonstration here. All of the above "knit" stitches are used in combination with the "purl" stitch to create all kinds of lovely fabrics out of yarn! and with your loom tool come from above the loop and snag the working yarn creating a new loop, remove the old loop and replace with the new loop. Isela demonstrates this stitch here. When a pattern says to knit in stockinette stitch for "x" amount of inches you can use ANY of the above mentioned "knit" stitches (i.e. flat knit, regular knit/reverse purl, e-wrap/twisted knit stitch). You will want to use whichever one gets you to gauge on the pattern. The stockinette stitch is a series of knit stitches that produce a smooth fabric which tends to curl since there are not any counter balance stitches used. To create a stitch pattern that is referred to as the "garter stitch" on the loom you will knit one row in all "knit" stitches and one row of all "purl" stitches. A garter stitch pattern is a bumpy fabric and is also a fabric that will lay flat since it is counter balanced from the knits and purls. To do a one by one Rib stitch you will do the following: *Knit one stitch, purl one stitch, repeat from * to end of row or round. On the next row or round do the same. If you want to do a two by two rib you would knit 2, purl 2.